Having been burnt so many times, I didn’t know what to believe, but for once the FB pages did get it right, and yes!! the launch show happened AND Fawad Khan showed up — Zindagi Gulzar Hai indeed!! This launch show was indeed worth the wait … for once the host, Fahad Mustafa, was able to contain his enthusiasm long enough to let others speak – and we actually heard Fawad speak more than three sentences…. Along with a rakish Fawad, there were Sanam Saeed (what was up with that chalky powder on her face? ), Samina Peerzada, Momina Duraid, Sultana Siddiqui, Javed Shaikh, Mehreen Raheal, Ayesha Omar, Hina Bayat, and Hadiqa Kiyani, all of whom spoke very eloquently about their respective roles in the project. Poor Ali Zafar, though, was the only exception – he had been woken up just for the call-in, and the poor guy sounded more than half dead. Oh and a huge surprise – Umera Ahmed called in! The male version of the OST was premiered on the show. Written, composed and sung by Ali Zafar, it sounded a lot more upbeat than the female version by Hadiqa Kiyani. The reason for the two OSTs and their completely different styles was explained by the director as being deliberate, in order to highlight the different personalities of the protagonists. Some fun things that came up/struck me during this show: a) Samina Peerzada requesting HUM TV to carry a disclaimer about smoking and Fawad’s visible squirming; b) Apparently the rumors had indeed been true – Fawad had been asked to do the OST, he backed out and Ali Zafar was later invited to do the OST; c) Seems like Sania Maskatiya has signed some kind of a deal with HUM TV; Momina Duraid and Samina Peerzada were both wearing her stuff. After having seen the clips, all I can say that seems like it is indeed worth the hype. With a stellar director like Sultan Siddiqui heading the project, a talent like Shehzad Kashmiri behind the camera, and the support of technical facilities of MD Productions, I think we are in for a treat. Below are some pictuers from the launch show and the two videos for the OSTs: the complete Hadiqa Kiyani version and a clip of the Ali Zafar one. Yaar, can one be a little tired of the hype before a drama? I think so. I am! FK looked like FK 🙂 Sanam I like but I’d like her more if she was not so made up. Had enough of Sania M. Plz find another designer now! btw Why do they Ashar’s pic up and not Zaroon’s ? What a blooper! @Afia: I agree – those pics are so out of place with all the hype they are doing – thora sa paisa aur kharch lete! Yes, I think Hadiqas OST was written and composed by other people, whereas AZ did his own. well its way past my bed time but oh the things we do for Fawad Khan! but i must agree with @Afia the hype is getting tiring and i just want the drama to star already!! and really like Sanam as well but her look was just not working well for her..
needless to say really enjoyed the launch show, FK looked oh so cute!! :*, although he doesn’t talk much and comes off really nervous. Nothing much to add as the review very nicely talks us about the points that stood out. Looks like UA finally wrote a pro women script and i for one cannot wait to see the two different takes on life becoming one! Well just saw the show as i missed it in the morning,it was really enjoyable. The indus college student who said Fawad jaha jatay hain woh jagah hit ho jati hai was hilarious,some director should scoop him up for acting,the girl who called Fawad jis kay hath paon thanday ho rehay they was so cute,it’s always good to listen to Fawad fan’s as they are so genuine.Loved the outfits of Momina and Samina and Fawad looked handsome as usual.It was good he spoke more than usual. SZ so right Ali Zafar bechara was dead beat ,he was taking time to remember what he was suppose to say.Oh yes i don’t want to see a cigarette smoking Fawad on my screens plz. run a disclaimer atleast before the show hum TV. Thanks for the prompt review SZ it’s always a delight reading them. Did you notice when Samina was asking for a disclaimer, no one agreed with her…or said haan. Yes i guess because it also turned into a pun at Fawad’s smoking in real life.But TV channels should now start paying serious heed to the issue ,in all the international plays either they never show lead character smoking (except for Mad men which is a period drama of sixties and one or two others) and they always run disclaimer.Hum Tv repeatedly says it’s a qualitative drama channel,i guess there is nothing bad in taking these issues a little seriously.Smoking is not cool or dashing anymore so they should stop putting cigarettes in heroes hands is my own personal opinion. I didnt know sz you would be this fast in writing it up! Oh and I saw the Ali zafar ost on ZGH page, it was ok not great, definitely prefer hadiqas though. @ Afia Haha… I saw how everyone just got quiet and tried to gloss over it. That’s one thing that gets me too, Fawad seems to smoke in every drama, just not cool! Loved those Indus valley clips, Fawad is just too modest, such a level headed person and always thankful, considering he feels like a 2 headed snake at a circus…poor guy fahad kept asking him about how he felt about larkiyan going crazy about him? What’s he supposed to say, he’s so decent. I think that’s another part of why he’s so popular, his personality is lovely. Oh and Afia, I think he loves those v- neck cashmere type sweaters, he always looks well dressed! Well now we have Friday to look fwd to IA and our lovely discussions too! I was thinking SK that Fawad can give a lesson to Fahad on how to dress lol What was that awful blue jacket he was wearing that he borrowed from the concierge services! yes I have seen FQ dress in some really odd outfits on his morning shows! Where the heck do they find this stuff and who tells them they look good in it – awful! I know what you mean Afia I loved Samina’s suggestion and everyone was like eh…. there is no need to show actors smoking. Whenever I see one on screen, I always wonder how many cigarettes they smoked with all the retakes they did and what that has done to the person standing next to them (in this case Mehreen Raheel) lungs!!! Kaali nahi tow brown zaroor ho gaaye hogi. I watched a good 90 minutes of the show live and it was a fun watch. I was surprised to see FK there since I was not expecting him, and poor guy always gets tongue tied with all the appreciation and weird questions that are asked of him. I am just not digging the new hairstyle 😦 looks so 3 Musketeer-ish. Buss sword and armour ki kaami thi. Maybe he’s playing Mohd. bin Qasim for his next project? Agreed on Sanam’s makeup! She’s such a pretty girl – why oh why was the makeup so loud and cakey and the hairstyle oh so boho! Enjoyed the call from Umera Ahmed. Ali Zafar is always a sleep in the mornings…not sure why they call the poor guy. He always sounds like that at 9 am! lol and why does Hadiqa wear the same clothes (from the 80s) – aur kapray nahi hain kya? the dude from Indus Valley was hilarious but they overdid it 😉 Liked Momina’s comment that during some scene there were no guys just girls because guys refused to be there LOL!!!! Also liked Sultana aapa’s message. Hadiqa Kiani was like a Mard Maar aurat meets Lara Croft! She’s always liked wearing trousers and jackets but these ones were obscene. LOL @ Fahad M’s jacket. Poor guy thought he was looking oh so cool with his popped collar and all. Sanam: “Kabhi socha hi nahin” – On feeling responsible for the delivery of Umera’s tough lines. Really socha hi nahin? Sleepy he might be but I felt Ali Zafar was sounding disinterested to the point of appearing rude. Saying things like “Mein tv nahin dekhta” to people who make a living out of tv. Maybe there’s some FK-AZ history/rivalry in the background? I get the feeling from Sanam that she is really not interested in doing Pakistani drama. I think she probably wants to make a name doing British or American sitcoms and movies. Just the feeling I’ve had seeing her indifference during the interviews she’s done so far and a comment I had read a while back on her FB page. what Brit or American stuff has she done? i think another reason could be, her urdu is not that great. They mention that allllll the time, but whenever i hear her speak urdu it sounds perfectly normal and there is no accent. @Javeria: true that Hum TV should take the lead on banning smoking scenes in their dramas, given their rep for being a trendsetter. @Afia: yaar bechara Ali Zafar, actually he’s always praised FK and vice versa, so cant think of this as being a rivalry. I think AZ was just being honest, most people who live the crazy kind of life he is living these days, do actually end up watching everything on YT or dvds. They should’ve shown a recorded a message from him, just like they did with others. I was a little afraid when Hadiqa hugged Sultana aunty ke kahin unn bechari ke eyes na hurt kerdai with that jacket of hers. So Farhan has done Malal, Dastaan, Sanjha, and this one for sure .. there could be other stuff that I don’t know about… Isnt it great that we have such fabulous talented people bringing us such amazing work! ah did not know about Sanjha – I guess because his work there was very traditional and not edgy by any means 🙂 I know I was completely bowled over by his work in Dastaan and now CK – just wow!! you are right such talented folks that hide behind the camera (literally!) – wish they would come on some morning show with a good host who asks them relevant questions! Thanks for educating us about DOPs! Then S Kasmiri did humsafar, sez, ashk? 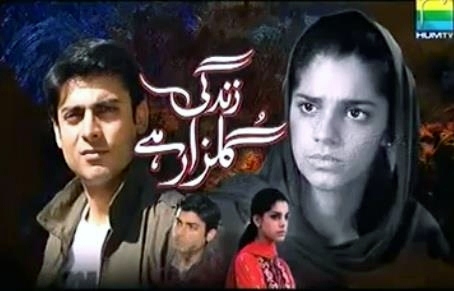 Which drama was malal? Sounds so familiar but can’t place it. The storyline revolves around Zinia and Danish (Faisal Rehman) who are close friends of fifteen years, living in the US. Danish goes to Pakistan to visit his mother (Shameem Hilali), and agrees to get married to the girl of her choice, Mahi (Sarwat Gilani). When Zinia learns of his marriage, she becomes extremely upset. Meanwhile, she meets Jawad (Imran Abbas Naqvi), who turns out to be Mahi’s cousin. She is almost a decade older than him. They begin to meet frequently, which upsets Danish, and the realization that his wife is immature does not help matters. To make the situation worse, Zinia discovers that Mahi is being blackmailed by someone from her past, Saifi (Adeel Ahmed). Oh yes, I remember that now! thanks! MJ’s direction. There was an FK interview in a urdu paper some time back. When they asked him about who he envies, he replied Alizafar and atif aslam ! Awww how sweet is that! . Don’t know if this was a genuine interview though. yeah agree with Sadaf: Shaheen Rasheed is a legitimate, well-respected journalist ..
Yaar how do u know the names of all journalists? Loved the show and YAYA! You reviewed it;) double treat! I agree with you, Thank GOD Fawad spoke more today, we got to see more of him. I feel he is very down to earth. I, too, loved his expressions when Samina Pirzada spoke of cigarette smoking scene and all. Sanam too was smirking and looking side to side. I liked Sultana Siddiqui’s presence on this show, it was a a lively show because of her. Heela, glad you enjoyed the post – ab since I had already spent time watching, thought I might as well share my thoughts and hear what everybody else thought, because its so much fun to always discuss every minute detail to death wit like-minded friends – makes the whole experience so much more enjoyable 🙂 Yes, now Fri needs to just come on already!! Read your review and took a sigh of relief of show being great..! Finally got free time to see and it was indeed worth the wait.. Fawad khan.. modest person i have seen on television.. and what was Fahad asking again and again ‘kaisa lagta he/kaise mahsoos karte hain’ araay bhaee bhaksh do bechare ko… Sanam was actually good and spontaneous in answers..
Sultana Sidique coming to show made it full of quality and caliber.. all things being talked or discussed were so intriguing..I liked how Momina shared ZGH being first writing of Umera.. too good! Hadiqa said infinite times (no matter what the question was) as it was Sultana aunty, i had to say yes,, fine lady we got it!! Last but not the least.. THE call.. i never thought, i could hear Umera’s voice.. she knew what she has to speak and to whom..Excellent! But yeah the show was fun and Im glad you didnt feel let down after reading my post 🙂 Yes, Fahad was annoying – but at least this time he was letting other people talk, and bechara AZ, I felt really sorry for him!! Lols! you see, for me to enjoy something i really need to be active and fresh else i ditto sound like AZ 😀 sometimes its bit annoying as i am literally last one to watch something..
@ Rehmat: Well at least commercials se to bach gaye! The one reason i hate watching live shows, commercials drive me insane. But it was fun, both shows. I however was AZ all day today, totally can relate to his phone call in the show! Good show and perfect write up SZ 🙂 Missed some of it ,probably that is when Samina Peerzada was talking about the smoking issue. I really wish they would take that seriously ,lung cancer is no joke and I understand if someone cannot stop smoking but do not glorify it on screen .Is it only me and my friends who did not like the violence portrayed in the promo for ZGH ? Zaroon almost knocked bechari Kashaf out and later they are suppose to have a relationship? I don’t think that is an appropriate thing to show. Ok you thought Fawad looked rakish? I guess its the hair,He looked kind of shy to me. He was actually blushing each time that guy came on the screen and said that . This is why I like him so much, he even said he was not such a great actor and could not understand why people were so impressed. I could write a thesis believe me.. Thank God I missed Ali Zafer, I met him twice up close in Dallas when He was not THE ALI ZAFER and He was kind of unimpressive .We had sponsored a show for 14 th of August and the first time when he was singing he just kept coming closer to me and I know he did not mean it probably, but he gave me the creeps. The next time I did not even try and let the little kids get his autograph because he kept putting his arm around people. So he does not watch TV? Well no one watched his Movies so its all fair and square. I may be deluded but Fawad comes over as a nice ,shareef, family oriented person . Not met AZ but your story sure hints of stuff. Just the fact what he’s been upto in his movies is creepy enough. FK’s ‘perfect’ to meet (aur kya kahoon) and has been in love with the same woman since almost childhood! It was a good show. For the 1st time Fahad Mustafa let his guests talk & didn’t interrupt them while they were talking. Why did FK have a beard & a mustache? He looks so much better clean shaven. Maybe the role in Bin Roye Ansu requires him to have that look, so he can look rugged. The call from Ali Zafar was just plain rude. It wasn’t that early in the morning, so why was he pretending to be sleeping? I don’t know if he was half asleep or drunk but he sure pretended to be more superior than all the television personalities. @Sadaf: you’re right, we don’t watch his movies so its all fair. Sadaf,, did you see the part where they are talking about the violent scene? It was in the first part I believe. So actually it’s been toned down from the novel, where zaroon properly slaps her! Obviously due to the image that would have sent, the slap was omitted, sanam said she couldn’t believe the novel readers were looking forward to that scene the most, that a woman gets slapped!! You know I didn’t even know when people kept talking about slap scene, slap scene…I thought maybe kashaf had slapped him, really couldn’t believe it was other way round! You are right, it probably is still a little too violent, but let’s see what precedes it and how it is dealt with afterwards. I am sure it will not be glorified as the right thing to do. No it was not a bad experience as such , I just was not particularily impressed. I have met one or two celebrities and usually it is sooo exciting but cannot say that about him. He probably could say the same about me as in who ? What? 🙂 let’s see. from what I remember he wasn’t angry as such. Ok shall wait and watch . agree Afia – not angry but initially a bit aloof during the college days and egotistical to a certain extent. Later on too, having a bit of a chip on his shoulder same as Kashaf’s character. Let’s see how it plays it out on screen because it does seem that they have softened him up quite a bit. Hope you do not mind ,I am stealing this for my Facebook .It kind of reinforces what he has said previously.Well I for one am hoping he or at least one of our stars can make that leap. Something fun instead of Bol but with emotional depth like Humsafer . Anyone watching live humtv?? The ZGH actors, ke comments wale clips are getting quite annoying..
its basically short clips of each actor talking about their role in the drama. So far I’ve seen Sanam Saeed, Fawad Khan, Samina Peerzada and Javed Sheikh. They were either recorded before or after the JPJ show. Yikes! Didn’t see them but that will totally turn people off bad marketing strategy Dursid bhaisaab! Tomorrow, I hope my zindagi will be more gulzar after it begins. First of all what is compelling me to sit down and write this long over drawn comments. I will point out the negative stuff first. 1)someone please tell who ever in charge of marketing: to reduce the amount of promo one plays on TV multiple times. Ok so I come home and while making dinner, I turn on the TV and in the 20 minutes that I spent in the kitchen, 10 FULL minutes were dedicated to ZGH. I heard the promo, the actors telling us to watch their drama and pretty much all crucial scenes played over and over and over and over again, like for a millionth time. I mean bombard karni kay haad hoti hai! I am looking forward to ZGH but this new blitz of ads is waning me out and from the look of it many other people too. 2) I completely agree with Sadaf that when Samina brought up the point about excessive use of smoking from actors and portrayed in characters, everyone just shrugged it off. I hope this picture will provide a little bit more insight. Take this seriously. And no I am not kidding. Pakistan is a developing nation, while here in developing countries we try to figure out how we can keep people 10 ft away from buildings while they are smoking, I am shocked that we don’t have any policies regarding use of excessive smoke shown on our televisions. It’s a disgusting habit and by showing it in what is perceived to be drama targeted towards younger audience where the main character is smoking (and showing it as normal behavior), no my dear producers, directors and actors it is not cool! 3) I really am the last person to judge someone over their clothes but seriously I really want to speak my mind here: I think people who are born in foreign countries are certainly not the ones who suffer from identity crisis, but from people in Pakistan certainly do. I think Hadiqa is a perfect example of that! Enough said! 5)	Ali Zafar becharay ko waisay hi utha diya. I could not stop giggling at the close up face of Fahad Mustafa trying to understand what exactly Ali Zafar was bluttering! So jaoo Ali Zafar soo jaoo, abhi subha nahi howi mamu! 6)	Fawad as usual, spoke 2% more than what he usually does. Actually I found him more interactive in the humsafar JPJ show then this one. That kid in the indus valley should be in one drama. He was hilarious! Waisay mere bhi haath paoon thanday hoo rahay thay! Mujhe toh lagta hai ye drama kabhi on air nahi ho gah!! Ash there FB page has become quiet unreliable ,and cable is working fine.Even mobile service has been restored in Karachi and they are still running promos,but if that is so just ugh! They announced a new air date. It’s on the ZGH page as well. Yeah but there is no announcement on hum tv or their page. Check the humtv and ZGH page. It’s all over and they posted pics as well. What the heck. Yes just saw this now it will air from 30h nov 😦 😦 😦 ARY, HUM and GEO tv channels are not working in some areas of Pakistan. Okay I am so done w this drama. It’s never airing!! This is absolutely ridiculous… What was the point airing a million promos all day and messages from cast too if they were going to do this. We should all bombard the hum page with complaints! They’ll not care. Pakistan and their rules are so weird I swear. I feel like this drama is going to tank. They’re are testing our patience way too much. It’s the unprofessionalism that gets me…just no words for it. Did they not know of the problems yesterday, why did they have fawad saying chand ganto me ZGH araha hai. This looks like something else, I don’t know why it just looks fishy. What the heck,why are they not showing it on Hum Tv itself ,the people who have no access to there FB pages should know it as well,that really makes me want to give up on the play.God the wait has been endless. Zindagi gulzar hai nahi ab to zindagi bayzaar hai! I feel blue. Though, I do understand the unpredictable situation in Pakistan but still it is extremely disappointing to know that it’ll not air after a ten-months wait. Hayee! whatever 1% expectations I had have evaporated into the smog caused by cigarette smoke. I hope we get to see new episodes of our favorite shows tomorrow.